Diversity among board members – in terms of gender, race, age, and disability status, among other factors – is of increasing importance to boards and to investors. On gender, for example, whether you believe in quotas or not, the almost undeniable truth is that companies with women on their boards outperform companies with all-male boards. Our new proprietary research shows that top-quintile boards tend to have more female directors than their bottom-quartile counterparts, a finding that’s been echoed by several other firms, including Credit Suisse and McKinsey. Similarly, on age diversity, our research indicates that a wide range of age representation on a board is a positive indicator of a company’s performance. A number of leading companies have already stepped up their efforts to recruit women proactively. Meanwhile, investors continue to call for more women on boards. In the US, the New York State Common Retirement Fund announced in 2018 that it would vote against all board directors standing for re-election at companies that have no women on their boards. Where a company has only one woman on the board, the fund plans to vote against members of the governance committee. And in the UK, the Universities Superannuation Scheme (USS), the country’s largest private sector pension scheme, took a similar stance, saying that it would vote against or abstain from voting for members of the board’s nomination committee if a company had no female directors and had no timeline set to introduce them. If the company made no progress in subsequent years, USS said it would vote against board chairs. Despite those pledges – and a record number of independent seats on Fortune 500 boards going to women in 2017 – progress remains slow. At the current pace, women will not reach parity with men in new appointments in the US until 2025. The numbers look a bit more promising in Europe, with 41% of new independent director seats filled by women in Germany in 2017, 42% in France, and 39% in the UK. Both Germany and France have introduced regulatory requirements that have had a significant influence on the numbers. In Australia, 39% of new director seats in 2017 were filled by women. Progress is even slower for ethnic and racial diversity. 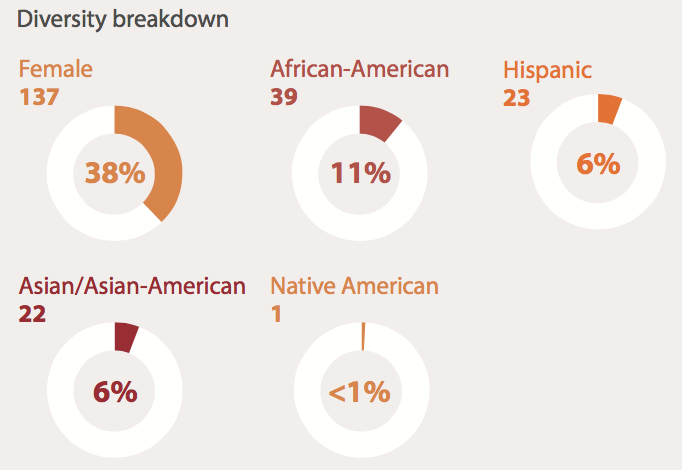 In the US in 2017, just 23.7% of all Fortune 500 new board appointments went to African-Americans, Hispanics, Asians, and Native Americans combined. A less visible, but equally important issue is that of people with disabilities. Thirty percent of white-collar professionals in the US have a disability, but only one in 10 will disclose it to their employers. As more and more people retire later, those figures will only rise. And while this may be a particularly difficult dimension of diversity to make provisions for, due to its complexity, our research indicates that it could prove to be extremely rewarding to tap into the knowledge of a group that has to find innovative solutions on a daily basis. Diversity among non-executive director appointments to Fortune 500 boards in 2018. Companies that act quickly will not only reap the business advantages of board diversity sooner rather than later, but also set the gold standard among their peers and send a strong message to their clients or customers and their employees that diversity matters. In European boardrooms, shifts in approach and targets for boards and how they are assembled has been at the forefront for several years, encouraging both diversity and performance. Although the decision making falls to the Nominating Committee, the push for diversity must also come from the Chair or a strong Lead Director or CEO who keeps it front and centre. Without strong support from one or more key members of the board, efforts to add diversity can often get sidelined. One leadership team in an industry notorious for its lack of diversity found success by expressing their commitment to diversity not as pressure, but as enthusiasm – an enthusiasm that spread infectiously to the entire Nominating Committee and resulted in one of the most diverse boards in the industry. The ideal candidate does not have to be a CEO. We have seen a clear shift in companies’ efforts to bring new perspectives: 36% of new board appointees in 2017 in the US had no previous board experience; and almost three-quarters of new directors had international experience. In Asia-Pacific, 22% had no previous board experience and in Europe the figure is 34%. And, notably, new proprietary research shows that 46% of all CEOs have previous experience as either CFOs or COOs. In addition to those executives, consider general managers, division heads, presidents of universities, retired public servants who have led large government agencies, and retired career military officers who have led complex commands. Consider also functional leaders whose expertise is relevant to a key area of your company’s strategy or entrepreneurs who have scaled a business. Executives who are earlier in their career often bring sharp new insights into the boardroom, especially on technology and industry disruption. The most effective boards build a recruiting plan and methodically tackle it. Often they get to know candidates before they can take a board role – investing in and developing a relationship. They think creatively about their most strategic needs and keep a focus on identifying diverse candidates, even when they are not in active recruiting mode. They ask major organizations like ELC and Catalyst for ideas. And they execute a disciplined recruiting strategy. It is hard work to build a board. Recruiting the right person takes time. Insist on being presented a diverse slate that includes women, people of different races and ages, and those with disabilities. Think about building a pipeline of ideas that enhances the culture of a board, not just recruiting one person today but, if you identify several great candidates for the long-term health of a board, consider adding them sooner than you might have planned. Indeed, some companies expand the size of their boards particularly to ensure long-term diversity by being able to add people when they become available. The definition of diversity has proved relatively fluid, changing with our increasing understanding of each group’s challenges. While the value of diversity to the global corporate world has been repeatedly shown, making it work remains a similarly fluid concept. Every company has to look at its purpose, strategy, and the current make-up of its board and workforce, and determine how to put in place inclusive cultures and practices. The key questions to ask yourself today are what do diversity and inclusion mean for you, and what is the next thing you will do to drive it in your organization once you depart the Annual Meeting in Davos? The views expressed in this article are those of the authors alone and not the World Economic Forum.